The surviving wooden structures and street plan are original and intact and together present a traditional townscape of the 17th and 18th centuries, the survival of which is unique in the region. The town continues to this day to be occupied and function as a trading port and center of commerce. The living heritage reflecting the diverse communities of the indigenous inhabitants of the town, as well as foreigners, has also been preserved and continues to be passed on. Hoi An Ancient Town remains an exceptionally well-preserved example of a Far Eastern port. Hoi An is one of the stops on the typical tourist route from Saigon to Hanoi. A very small town near the sea, it was a trading port for hundreds of years. It has an architectural style unlike what you will find in the rest of Vietnam. It isn’t the flashiest of sites, but it is a nice city and a worthwhile place to visit if you are in central Vietnam. Hoi An Ancient Town is a UNESCO World Heritage Site located in the Quang Nam province of Vietnam. It was inscribed into the list in 1999. The city currently has about 120,000 in population. The historic district is one of the best-preserved examples of the Southeast Asian trading ports from the 16th and 17th centuries. 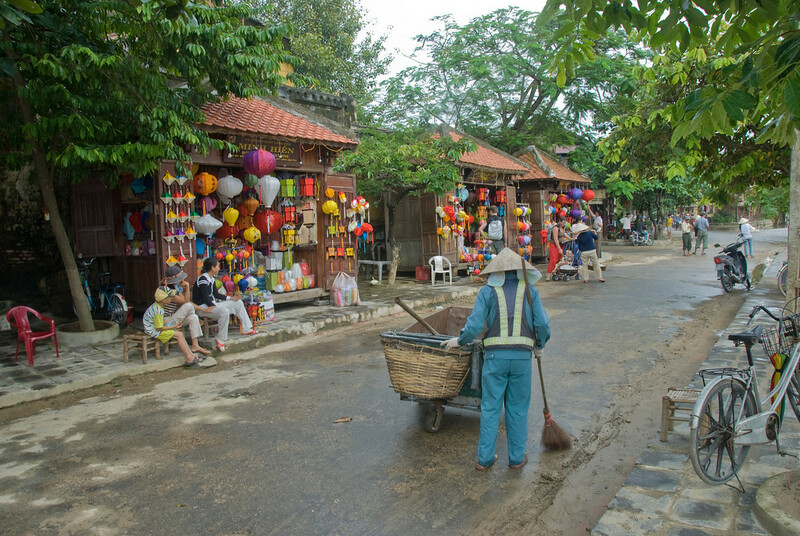 From the buildings to the street plans, the unique blend of indigenous and foreign influences is evident in Hoi An. The Japanese Bridge in the old town district of Hoi An is one of the most distinctive landmarks in the area. It was built in the 16th or 17th century. Today, the trading activity had long moved elsewhere. However, the historical heritage of the Hoi An Ancient Town is strongly preserved. The Old Town in Hoi An is where the highest concentration of preserved buildings and structures are during the time of the city being a major trading port. It is small enough to explore on foot. Plus, it is not as heavily populated so traffic is not an issue just like the bigger cities in Vietnam. There are some streets in the Old Town that only allow motorbikes and there are also those dedicated only for pedestrians. For this reason, a lot of tourists like to visit Hoi An as it provides a nice change of pace from Saigon or Ho Chi Minh City. 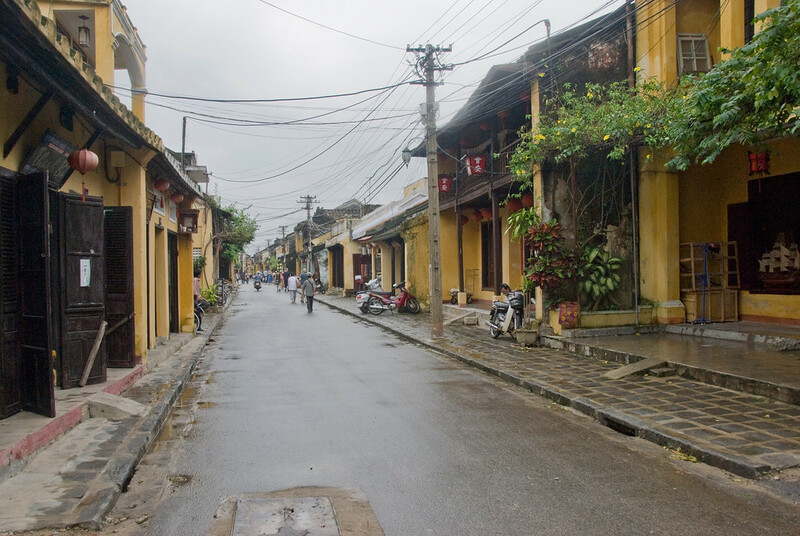 Several of the buildings and other structures within the Old Town in Hoi An were constructed more than a century ago. They also exhibit a strong Chinese influence particularly from the provinces of Guangzhou, Hainan, and Fujian. The buildings, especially those from merchants, bear the company names in a carved out board that depicts Chinese characters. This is evidence of a strong Chinese presence in Hoi An during the prosperous times of the Old Town. 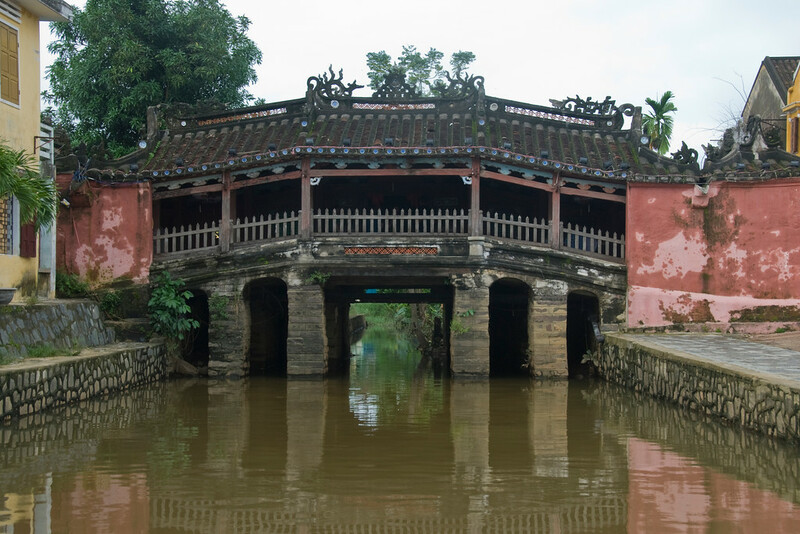 As mentioned above, the Japanese Bridge is the most distinctive landmark within Hoi An Ancient Town. But there are several other notable tourist attractions such as the Guan Yin Temple and the Chinese assembly halls. If you travel from May or June to end of August, you can expect a calm and mild weather in Hoi An. This is the best time to go. For the rest of the year, the weather in Hoi An is intermittent and can go from wet and cold to hot and humid. There are several ways to get around Hoi An and its Old Town. The most common options for tourists are bicycle, motorbikes, or motorboat. 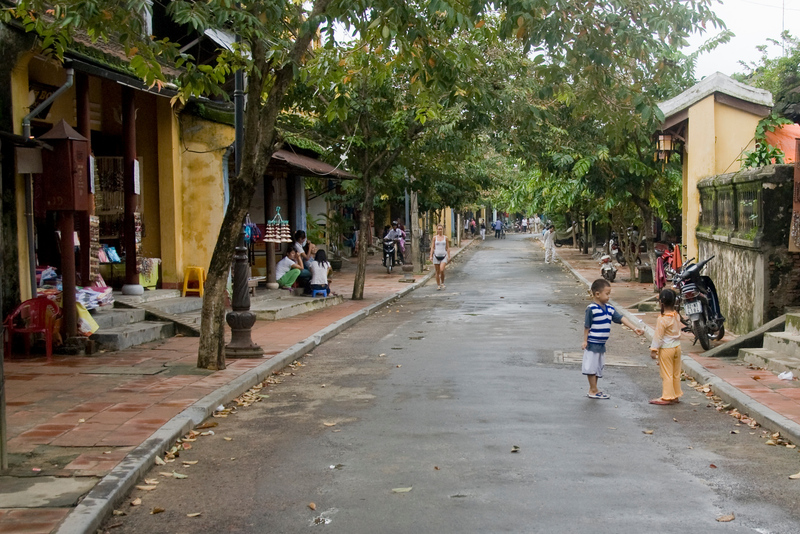 Despite the many transportation options within Hoi An, it is highly pedestrianized. Hence, you can expect to be walking around a lot during your exploration. The culinary landscape in Hoi An is influenced by the various cultures it had come into contact with during its long history. Hence, it is one of the most popular things for tourists to do while in Hoi An – to explore its many culinary offerings. There are many ways to travel to Hoi An Ancient Town. If you are coming from outside Vietnam, you can take a flight to Hanoi, Hue or Ho Chi Minh City. There are several flights to Vietnam from Bangkok, Siem Reap, Singapore, Cambodia, or Hong Kong. From the airport, you can take a metered taxi or the Hoi An airport transfer (which is recommended). There are also minibus taxis that you can take. All forms of transportation take about 45 minutes to reach Hoi An. You can also via train to Hoi An. However, the nearest train station is in Da Nang. There are several train routes traveling within a day to Hanoi, Ho Chi Minh City, or Hue. You can book your train ticket to Da Nang via your hotel or travel agent. From the train station, you can take the bus to Hoi An. The Japanese Covered Bridge is the most iconic landmark in Hoi An Ancient Town. The bridge is the best example of historical Japanese architecture in Vietnam. According to historians, it was built for by the Japanese in order to cross the Chinese quarters that was located on the other side of the town. The official opening of the bridge was in 1719; three Chinese symbols were also carved out above the door to the bridge to commemorate this momentous occasion. Over the years, there have been restorations and renovations done to preserve the bridge. The most recent renovation was done in 1986. The bridge currently stands as a symbol of Hoi An. Don’t forget also the place to have a custom made suit if you are travelling through Vietnam. Almost every store is a tailor shop, it’s gotten a bit out of hand actually. But if you’re in town for 48 hours you can easily take or ship home custom made threads and shoes to match! I never made it to Hoi An when I was there, wish I had, But I pretty much expected it to look as how you have captured it. I can smell the street odors and hear the people and children going about thair daily life. 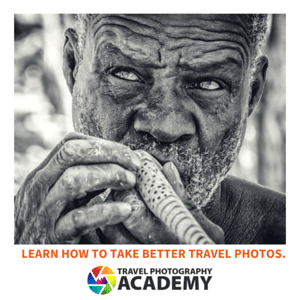 You have a good eye for capturing real life. Looks like an interesting place. Vietnam is on my list for the coming summer.